Professor Kathryn Grace (geography) is providing a unique opportunity for students to conduct independent research this semester through a brand-new course, “Applied Quantitative Methods Using Survey Data.” In the course, which is open to both graduates and undergraduates, students develop a research question related to global health and, using IPUMS PMA or IPUMS DHS data, learn the steps for answering it. 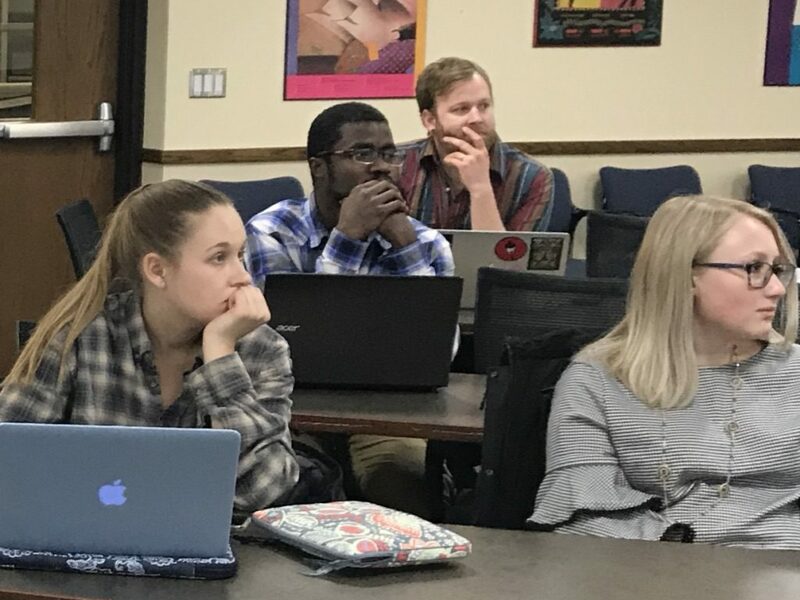 As part of their training, the students also participated in a day-long statistics workshop on “Conducting Individual-Level Analyses with Series of Cross-Sectional Data,” co-sponsored by ISRDI, the Institute for Research in Statistics and Its Applications, and the Commons for Research in the Social Sciences. 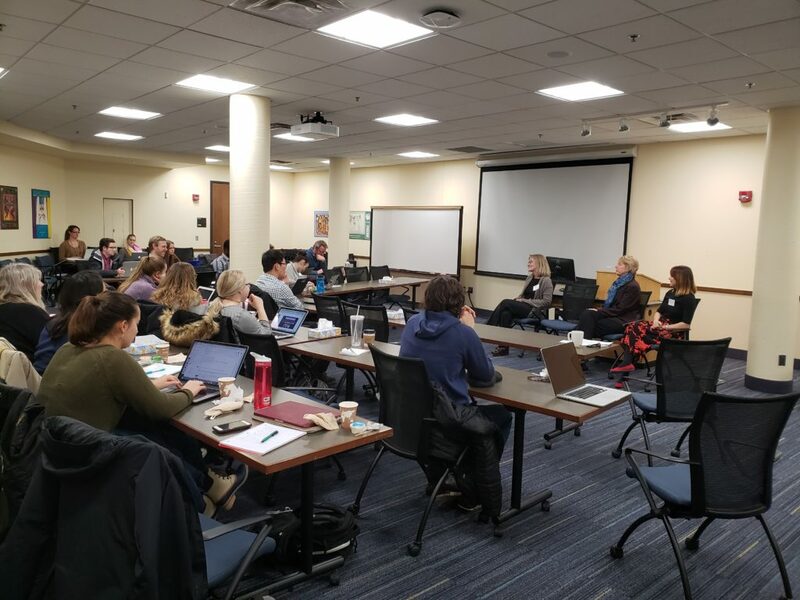 Kat Grace (geography), Liz Boyle (sociology), and Linnea Zimmerman (PMA2020) lead a discussion at the statistics workshop. The 15 students in the class are covering a broad range of topics. Chloe Husemoen, a senior BSE major, is interested in menstrual hygiene in India. The PMA surveys ask women “Is there anything … that would help you manage your menstrual period that you do not usually have?” Responses to this open-ended question cover a variety of responses, ranging from “a private place” to “pain medication.” Chloe wants to know how women’s responses are related to their education, household wealth, and urban or rural residence. She believes that understanding these relationships is a crucial step in effectively and efficiently addressing women’s hygiene needs. Students in Dr. Grace’s class listen to a presentation. Suzy Scotty, a senior geography major, is using IPUMS PMA to explore the relationship between the supply of family planning methods within communities and women’s ability to meet their personal family planning needs. She surmises that when local providers offer more family planning options, and ensure the consistency of their availability, women are better able to strategically plan the timing and number of their pregnancies. Devon Kristiansen presents on IPUMS PMA data. Isaac Asante-Wusu, a graduate student in geography, draws on IPUMS DHS data from Ghana to answer the question, “How are sanitation strategies impacting disease outbreak in Accra?” Isaac approaches this topic with the idea that understanding household sanitation practices is fundamental to understanding disease transmission and spread in urbanizing Accra. 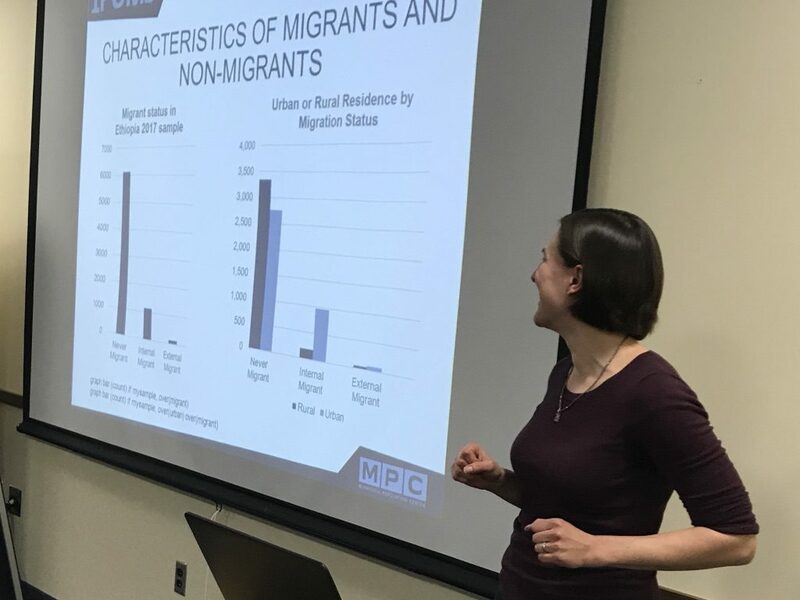 Kat Grace is getting lots of support from other ISRDI faculty and staff, including Professor Elizabeth Boyle (sociology), Devon Kristiansen (IPUMS PMA), Andrew Verdin (ISRDI), Elizabeth Wrigley-Field (sociology), Audrey Dorélien (Humphrey), and Miriam King (IPUMS DHS). The students’ efforts will culminate with poster presentations at the ISRDI (50 Willey Hall) on Wednesday, May 1. Please stop by between 1:30 and 3:00 p.m.to view the posters and question the students on what they learned!